01. Previous studies investigating the role of micronutrient supplements such as vitamin A and zinc in combating stunting have failed to establish a clear connection. 02. The focus of research has therefore expanded to include multiple micronutrient interventions and other comprehensive approaches. 03. It has been proposed that in populations with multiple micronutrient deficiencies, the effect of multiple micronutrient supplementation on linear growth will be more significant than single nutrient supplementation. 04. However, the results of multiple micronutrient intervention studies have also been mixed. 05. The variable success of single and multiple micronutrient interventions in improving linear growth have encouraged the development of new multifaceted approaches. 06. These strategies typically address holistic nutritional issues, as well as combating disease. 07. Because stunting is more difficult to reverse after 36 months of age, such comprehensive approaches require participation from the mother and the child. 08. 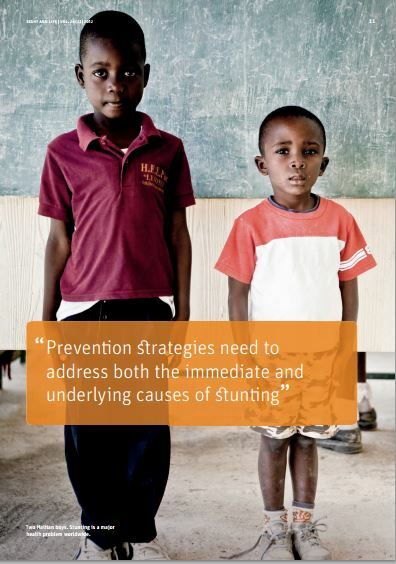 Further research is necessary to better understand the various factors that contribute to stunting. 09. Ultimately, stunting cannot be adequately addressed without taking into account socioeconomic factors such as disease and poverty. 10. Nonetheless, the role of nutrition continues to warrant additional attention.